New Delhi:(Page3 News Network)-The Vice President of India Shri M. Hamid Ansari has said that Dr. (Shrimati) Dinesh Nandini Dalmia lived and wrote through an era which was marked by monumental changes in our society. However, in her long career, she managed to keep her language and message contemporary and relevant to successive generations that she addressed. Addressing after releasing “Granthavali” a collection of her complete works (in 6-volumes) and re-launching Hindi Literary magazine ‘Richa’, of which Smt. 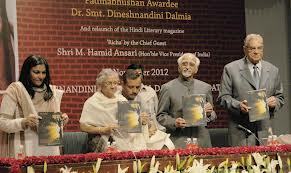 Dalmia was the Chief Editor, at a function here today, Shri Ansari said that Smt Dalmia was a remarkable woman, with a multifaceted personality, whose vision and ideas were far ahead of her times. She was an outstanding literary figure: an author of prose and poetry; a social reformer and a philanthropist. He said that despite having been born in a traditional society which did not encourage women’s education, she went on to become Rajasthan’s first woman post-graduate. She continued her literary journey with determination and ventured into the domain of poetry, short stories and novel writing. She pioneered a new style of prose poems ‘Gadya Kavya’ and lived and wrote through an era which was marked by monumental changes in our society. Her life and work continues to be an inspiration for all us. He wished the Dinesh Nandini Dalmia Foundation and the organizers all success in their endeavours.